Brain tumors cause progressive neurological disorder. Neurologic disorders in brain tumors typically considered to be caused by two factors: focal disruption caused by the tumor and increased intracranial pressure. Focal disturbance occurs when there is an emphasis on brain tissue, and infiltration or direct invasion of the brain parenchyma with damage to neuronal tissue. Changes in blood supply due to the pressure caused by the growing tumor causing brain tissue necrosis. Impaired arterial blood supply is generally manifest as an acute loss of function and may be confused with primary cerebrovascular disorders. Seizures as symptoms change in sensitivity of neurons associated with compression of the invasion and changes in blood supply to the brain tissue. 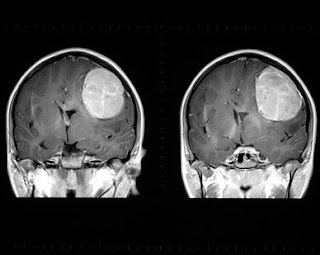 Some of the tumor, forming a cyst that also suppress the surrounding brain parenchyma so that aggravate focal neurological disruption. Increased intracranial pressure can be caused by several factors: the increase of the mass in the skull, the formation of edema around the tumor, and changes in the circulation of cerebrospinal fluid. Some tumors can cause bleeding. Venous obstruction and edema caused by damage to the blood brain barrier, all lead to an increase intracranial volume and increased intracranial pressure. Obstruction of the circulation of cerebrospinal fluid from the lateral ventricle into the subarachnoid space causing hydrocephalus. Increased intracranial pressure would endanger lives. Compensation mechanism takes time to become effective and therefore useless if the intracranial pressure arise quickly. This compensation mechanism among other works lowering intracranial blood volume, cerebrospinal fluid volume, intracellular fluid content and reduce parenchymal cells, the increase in pressure resulting in untreated unkus or cerebellar herniation, arising, bilagirus medial temporal lobe, sliding through a notch inferior territorial by the mass of the brain hemispheres. Herniation pressing mesensenfalon, causing loss of consciousness and hit the nerve of the third brain. Oblogata cord compression and stop breathing occur quickly. Other physiological changes caused by increased intracranial fast is progressive bradycardia, systemic hypertension (widening pulse pressure), and respiratory disorders.